Text boxes are notes that show up directly on the canvas. Notepads are notes that do not show up on the canvas. Instead, they are represented by an icon and viewed by double-clicking the icon. Text boxes and notepads are unique in that they can exist on the canvas irrespective of dates. This is useful for creating a header, footer, or watermark—the text box will not move with the network when the page size is changed or the canvas is stretched. Only text boxes and notepads possess this capability. Click the Text Box icon or Notepad icon from the toolbar. Move the cursor to the desired location or date on the canvas. Left-click with the mouse at the desired location or date, indicated by the text above the crosshairs. (Dragging the crosshairs will have no consequence on the shape of the text box or notepad). When finished, click anywhere on the canvas outside the text box or notepad. With the Select Tool chosen in the toolbar, right-click on the text box or notepad and choose Edit Text. With the Select Tool chosen in the toolbar, double-click the text box or notepad or right-click and choose Properties. The Text Object window will open. The Properties and Formatting section is where general settings as well as controls for changing the look are changed. Description A text that will show up on the canvas or in the notepad. Font The font for the text. Font Style The style of the text. Font Size The size of the text. Alignment The alignment of the text. Positioning Determines how the text box or notepad will behave when the page size is changed or the canvas is stretched. Effects Options for striking or underlining the text. Positioning options determine how the text box or notepad will behave when the page size is changed or the canvas is stretched. This is useful for creating a header, footer, or watermark. Fix Position to Determines whether or not the text object or notepad is tied to dates (like all NetPoint objects), or not. To create a header, footer, or watermark, choose Canvas Border. The Canvas Border Reference Point section will become enabled. See below. 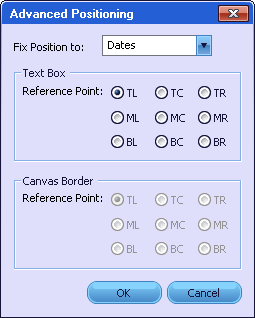 Text Box Reference Point Determines which corner of the text box is anchored to a date (or the canvas border, if chosen above). Options include Top Left, Middle Left, Bottom Left, Top Center, Middle Center, Bottom Center, Top Right, Middle Right, or Bottom Right. For example, if Dates and TR was chosen for a text box and the page size was changed or the canvas was stretched, the top right corner would move along to maintain the same date. Likewise, if additional text was added, the text box would increase down and to the left. Canvas Border Reference Point Determines which corner of the canvas the text box is anchored to (only when Canvas border is chosen above). Options include Top Left, Middle Left, Bottom Left, Top Center, Middle Center, Bottom Center, Top Right, Middle Right, or Bottom Right. For example, if Canvas Border and TR was chosen for a text box and the page size was changed or the canvas was stretched, the distance between the text box and the top right corner of the schedule would remain fixed. 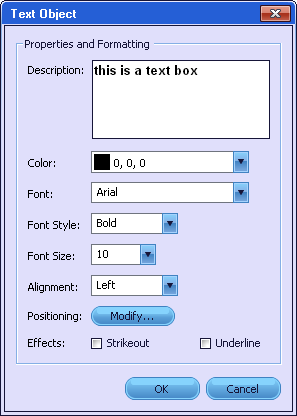 To create a header, set the Text Box Reference Point and the Canvas Border Reference Point to TC. To create a footer, set the Text Box Reference Point and the Canvas Border Reference Point to BC. To create a watermark, set the Text Box Reference Point and the Canvas Border Reference Point to MC.